Indulge in four hours of pure bliss with a custom massage, facial, salt scrub and mud body treatment. For your custom Santa Barbara massage, our therapist will address your specific needs to create a treatment that is the ultimate in relaxation. 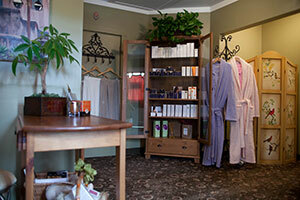 Next, enjoy a custom facial, created to improve your skin’s clarity and leave you with radiant skin. A full body exfoliation follows, which will slough off dead, dull cells, stimulate circulation, and detoxify. End your day with the Eifelfango Mud Treatment. Special mineral clay is used on your body to promote circulation and relax muscles. Warm compresses are applied and warm mud is massaged over your body, drawing out toxins and impurities, and leaving you feeling warm, supple, and relaxed. A light lunch will be provided at the end of your treatment. All treatments can be combined to create unique, custom packages.